I have recently gotten engaged after 4 years together with my boyfriend. I am happy, but I’ve found certain things that I think are inappropriate in a relationship. I’ve heard his voicemails and some have been other women. I don’t usually jump to conclusions, but now that I am engaged, I seem to take the relationship a little more serious. I am thinking that he is cheating on me, but I can’t see him doing that to me. He is very happy about our wedding and constantly states that we should just go to the justice of the peace. I don’t mind doing that, but I would like to now if he is being faithful or not. I don’t want to start a marriage on the wrong foot. I rather work with any problems now, then get married. I know if I approach him, he will get mad because I heard his voicemails. I don’t want to get disgusted by him because I really love him. I have to find a way to keep what I am feeling under control. I don’t want him to notice anything is wrong. We have a pretty good sexlife. At the beginning of the relationship, it was rocky, but it has gotten better. We don’t know a way to find out — a healthy way — other than to communicate. What stands in the way of that communication? I know that if I were concerned, I would communicate that concern. Even to the point of risking an angry response. Because the response would tell me a whole lot that I may need to know — one way or the other. 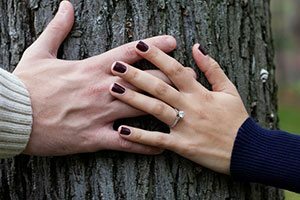 If my partner of 4 years and I were about to get engaged, and she had heard some voicemails of me and another woman / women — and she approached me with concern or insecurity over what is really going on — and if I were healthy in terms of my communication skills — and if I had nothing to hide — then it would be rather secondary to me whether she had overheard my voicemails — and I would make it a priority to address her concerns — until she felt that we had gotten somewhere, to a deeper level of trust. That would be the healthy response from a guy whose main concern was the solidity of the relationship and coming marriage. Literally, it would be stupid and self-destructive to have any other kind of response. Yet, as you probably know, people do not necessarily have the best communication skills — so there may be problems in that area. That itself would signal the need to develop better communication skills. And people don’t necessarily have the emotional skill level required to communicate about sensitive things. That would be a signal that they need to develop better emotional skills. And if those skills are not developed, then married or not, the relationship is at risk. Period. So, I’d ask, straightforward, probably spillling my heart out as to my fears, even about asking, and let reality reveal to me what kind of partner I had. One with skills and a clear intention to build our marriage on as solid a foundation as possible — or otherwise. If I got a self-defensive anger outburst at “how dare you listen to my voicemail” — and there was no voluntary addressing of my needs, fears or concerns — why, I guess that would tell me quite a bit. Sure, stuff that as long as I lived inside my own dream of the relationship, I would not want to hear. But, then again, I prefer to deal with reality as quickly as possible — because it will only catch up with you later, when it is even more painful. So I’d want to face the reality and ask the questions — not make accusations, certainly — and own my own fears and state them as mine — then wait and see what the real deal is with my potential lifetime partner as to skills and intentions brought out in response. ← How can you tell if someone is right for you?